I know some of you have it worse than we do in in the midwest, but it is cold here. They never close school here but my son had today off and will have tomorrow off. Too true. 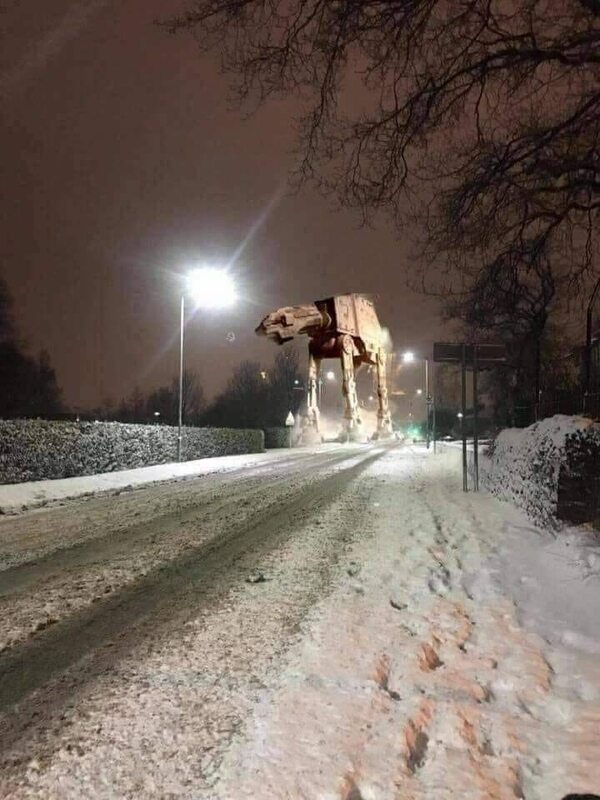 My location used to say 'Hoth Dakota'. Never did like the cold and I got it there in spades. -40 is no joke, folks. Ugh. It warmed up today to 11° right now (high of 22° today), but we got a fresh dumping of snow last night so school is cancelled for the third day in a row. It's a good thing I work at home or my wife and I would have to miss a lot of work. I hope the dog can hold on until later when the street gets cleared to go outside. I escaped to the Gulf coast five years ago and I'm not going back. No sir, had my fill of it and they can't make me return. I hope the dog can hold on until later when the street gets cleared to go outside. 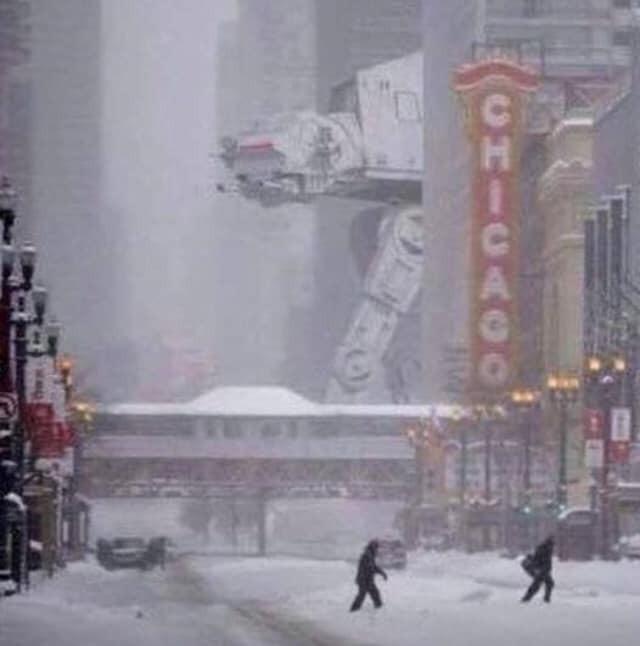 Funny story about that: We had a small dog, Chewie, in Hoth Dakota who had to go outside in winter. I opened the door and he leapt off the porch into a snow drift and vanished! I ran outside and peered down the doggie-shaped hole in the drift and there was Chewie about two feet down, just patiently waiting for me to get with the program and dig him out. I did so and we walked to a bare patch of ground a few yards away, completed his task, and returned to the warm house. He approached snow drifts cautiously after that. At first, I wondered if your Auto-Correct had somehow changed "North Dakota" to "Hoth Dakota", but after some consideration, I realized it was true either way. Meanwhile, in Northern California, yesterday was sunny, with a high of 63. You can hate me if you like, I can handle it. Yup. It's really a frozen hell. And warmer weather is a huge reason I moved back to civilization. I worked in places where it was 2 hours to a Wal-Mart in ANY direction. Not kidding. On the other hand, my job did require travel to and through some of the most beautiful and rugged parts of Wyoming, Montana, and Colorado so it wasn't all bad. Just mostly bad. Well that was a good experience for Chewie and he learned from it. Buttercup is a rescue dog. Before we adopted her, she had sadly been left to live in a basement crate in her own filth for extended periods of time. She doesn't just go out and do her business. She just has to enjoy the relative freedom of the leash and a neighborhood full of dogs so she has to go on long walks to sniff all the other dog scents and mark her territory. We've tried to train her but the most I've accomplished is getting her to pee with minimal sniffing right out front before bed. Even though she hates getting all bundled up, she loves her walks. I sacrificed my lunch shift to take her out to find small areas that had been shoveled or driven through. She'll still jump into snow to smell a bush if she really wants to. I hate you. Seriously, I have to be careful from now on using the term "brutal winter" because brutal will start to lose some meaning. So far, this has been a truly brutal winter. Having a dog that has to walk twice a day has been difficult. Having a dog that has to walk twice a day has been difficult. And this is why we've always been cat people in my family, even before I was born. We've had a Siamese named Gaston (who was a gift to my parents just before I was born), then we had an Abyssinian named Whiskers, then two Burmese cats named Charlie and Misha, then my mom and I surprised my sister with a gift of a Sorrel Abyssinian named Tybalt while she was getting her Masters at UVA. Out of all of them, Tybalt was the most beloved because he had the most personality of all of them. We did have a Cocker Spaniel named Hunter around the same time as we had Whiskers, but the poor thing was as dumb as a box of rocks (we got him from a pet store in the early 80s and we didn't know about puppy mills back then). We loved him, but taking care of him was alot of work. We know from experience that dogs are ALOT more high maintenance than cats. Funny story about that: We had a small dog, Chewie, in Hoth Dakota who had to go outside in winter. I opened the door and he leapt off the porch into a snow drift and vanished! I ran outside and peered down the doggie-shaped hole in the drift and there was Chewie about two feet down, just patiently waiting for me to get with the program and dig him out. I love how some pets just have that look on their faces that says "Oi! Human! I'm waiting on you to figure this out!" Sometimes, there really are some animals that are smarter than some humans. But that's still hilarious that your dog leaped into a snowdrift and sank so far in that he disappeared from view. That's like something out of a cartoon. 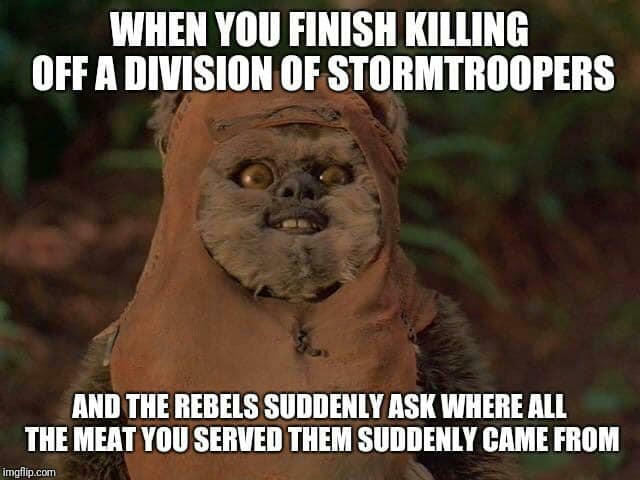 It's not cannibalism since they don't eat other Ewoks. Yeeeeeah, I don't think that definition will fly in a galaxy with literally millions of sapient/sentient species. After all, would any (honest) court in the GFFA rule that it's not cannibalism if a Duros ate the meat of a human? Or if a human ate Wookiee meat? Or if a Chiss ate Ithorian meat? In a universe with so many different sentint species, I think it would be inevitable that cannibalism's definition would be expanded from "eating your own kind" to "eating any sentient creature." It's still a funny picture, though. Ewoks! Making cannibalism cute since 1983! Ewoks live in a nature sanctuary. They are not subject to galactic law. And it is not a morality issue for them - Ewoks think only Ewoks are sentient. And Threepio. They are primitive, so they don't know better. Ewok law forbids Ewoks from eating other Ewoks, which is their definition of cannibalism. And after the Battle of Endor, it was a matter of practicality - What else could you do with all those bodies but eat them?